AZURA Lab Bio LC 10 is a gradient system for more complex purification of biomolecules on a laboratory scale. 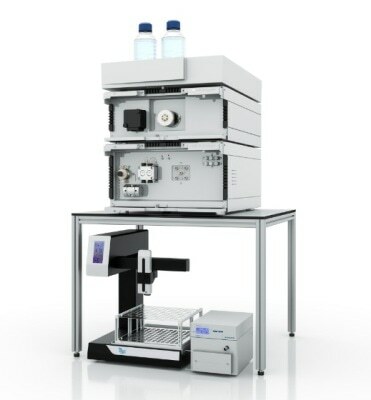 It is designed and optimized for all FPLC applications like size exclusion, ion exchange and affinity chromatography. The system proposal consists of a biocompatible buffer pump equipped with the possibility to perform a gradient between four buffers. Monitor your gradient over the whole run using the conductivity monitor. Inject your sample via the injection valve and detect your substances using the integrated single wavelength UV detector. The fraction collector collects your purified fractions reliably. The system is controlled via user friendly FPLC software PurityChrom® Bio. This software offers a high flexibility in method development and provides you with complete control over your run. Pre-designed methods are included in the software and can be easily adapted by changing the column volume.